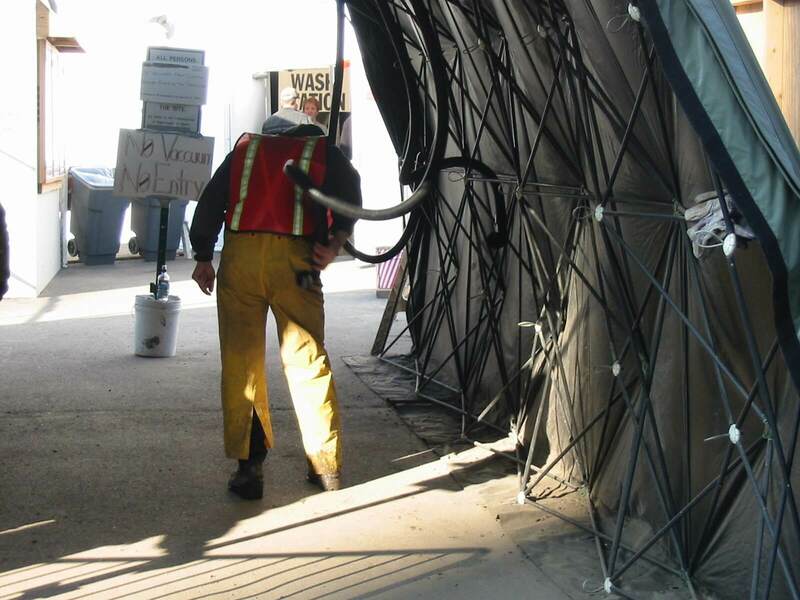 VAC-PAC Deployed during World Trade Center Clean-Up | Pentek, Inc. Featured Photo courtesy of EPA. 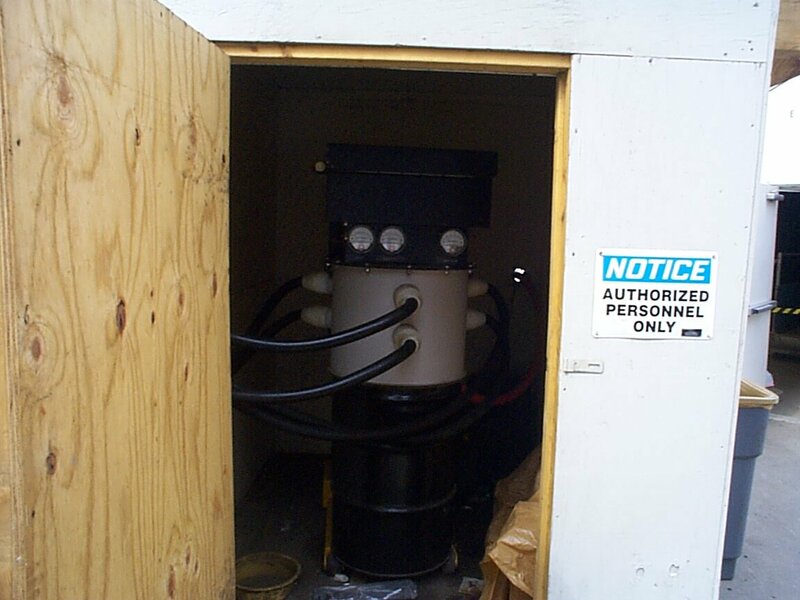 On November 1st 2002, Pentek’s VAC-PAC® technology was qualified and placed into service at the World Trade Center site to assist with personnel decontamination during clean up efforts. Although the tragic events of 9/11 did not directly involve the use of nuclear (radiological), biological or chemical products, the range of potential hazardous materials involved in the cleanup efforts can be categorized as such. As a result of the catastrophic loss of life, there was a potential biological hazard that could not be ruled out. Workers did wear limited personal protective equipment even though the area was never considered a bio-hazard site. 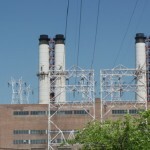 The potential chemical hazards included PCB’s, jet fuel, CO, sulfuric acid, freon and natural gas leaks as well as silica and asbestos dusts. The potential radiological exposure stemmed from a combination of isotopes found within the World Trade Center and the Boeing 757’s although none were detected. Some WTC occupants used radioisotopes for different medical purposes while the aircraft used them for monitoring systems and stabilizing weights. Due to the magnitude of the clean up and the extent of the potential hazards involved, the different governing agencies quickly defined the need for state-of-the-art technologies like detection, communication, personal protective and decontamination equipment. Earth Tech, Inc. was involved with the clean up efforts at the World Trade Center through an EPA Emergency Response and Recovery Service contract in Region 2. One of several orders Earth Tech received from the EPA was to set up and coordinate the primary personnel decontamination point. 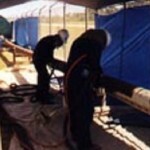 Prior to exiting the Ground Zero exclusion zone every worker was required to pass through the decontamination point to remove any PPE, post vacuum and wash. The primary decontamination point was a 33,000 square foot controlled area where 150,000 workers were processed every month. It was at this location the VAC-PAC® was deployed for personnel decontamination efforts. Earth Tech was able to keep the VAC-PAC® outside the decon area while supplying six vacuum hoses to the interior from overhead. This is possible due to the VAC-PAC’s ability to deliver 600 cfm of uninterrupted vacuum flow thru lengths of hose up to 200 feet away. This eliminated nuisance trip hazards from within the decon area where workers would converge due to the controlled facility entry route. The VAC-PAC’s powerful suction allows it to be kept outside of the decontamination area. Earth Tech chose the VAC-PAC® technology because of its dependability, integrated safety features and multi-port vacuuming capability. Due to the non-stop clean up efforts, Earth Tech needed a HEPA vacuum with limited moving parts that could operate 24 hours/day, 7 days/week without failure. The VAC-PAC’s vacuum flow is generated by forcing compressed air through a venturi, thus providing a virtually maintenance free system with no moving parts. Earth Tech was also interested in a single HEPA vacuum that had the capability of supplying multiple vacuum hoses to the decontamination area. This design allows for waste centralization and eliminates the need for multiple HEPA vacuum units. The VAC-PAC® also has many built-in safety features including a patented Drum Change-Out Procedure that allows field personnel to fill, seal and replace waste drums under controlled conditions eliminating potential for exposures during change-outs. 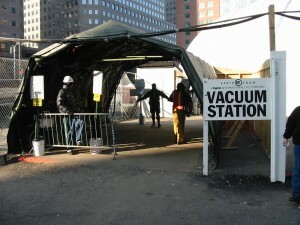 Vacuum Station in use by a worker at Ground Zero. For more information, please email us, see our contact page or visit our vacuum tool and robotics product pages.